A woman's tearful protest on top of a Mercedes has gone viral. The angry woman sitting on the hood of a red Mercedes was not just an angry woman sitting on the hood of a red Mercedes. She was a metaphor for some of the deeper injustices in Chinese society. And now video of the woman, called by the alias of Wang Qian in Chinese media, has gone viral. "What has made this highly educated literate person turn into a 'shrew?' It is worth pondering by our whole society," one netizen named Qingerting wrote on Weibo, China's equivalent of Twitter. In the video, "Wang" is shown sitting on the hood of a red sedan in a Mercedes-Benz dealership showroom in the central Chinese city of Xian. She is crying and complaining that the new CLS 300 coupe she bought in late March, a 30th birthday present for herself, had started to leak oil even before she drove it out of the store. The dealership said it would change the engine but could not give her a refund or a replacement vehicle, and she was unsatisfied with that remedy, prompting her to take extreme measures. "I'm an educated person, with a master's degree. But this incident is a burning shame for my decades of education," she says in the video. "I wouldn't be doing something so shameful if I thought we could still discuss this." The video that went viral was six minutes long, but in an 18-minute audio recording of the woman's consultation with the dealership's general manager released separately, "Wang" complains that when she went into the dealership, she intended to pay for the car outright. But she says the staff persuaded her to get a loan, and as a result she was charged a "financial services fee" of 15,000 yuan, or about $2,200. The whole thing was like watching and listening to a slow-motion car crash, but with only the car, not the crash. It didn't seem to matter that the woman was buying a luxury car that very few of her 1.4 billion compatriots could even dream of buying. In fact, they saw her as the victim of a rich and powerful bully - the car dealer. The woman's creative way of defending her consumer rights struck a chord with Chinese internet commentators. On social media, netizens saw the video as an eruption of the frustration that some have experienced in dealing with dishonest businesses and when seeking help from the authorities to rectify problems. Many commenters praised the woman's composure and how articulate and logical she was when arguing with the dealer. "I feel that the female Mercedes-Benz owner must have been on her university debate team," wrote Weibo user Zhanjieshaonian. "The logic, the expression is so clear and complete." Another user, -WHR-, added: "After watching the video of the whole process of the female Mercedes-Benz owner safeguarding her rights, I have only one feeling: courage is very important, and logic and expression are more important, If it was me, I'd be trapped." Away from social media, however, the woman was not showered with praise and encouragement. "Wang" said she has been threatened and has received text messages every day from people scolding her for her behavior. But her tactics and the resulting attention - in state media as well as online - worked. The customer confirmed Tuesday that she had reached a settlement with the dealership, which includes replacing the old car with a new one and refunding the "financial services fee." The timing could hardly have been worse for Mercedes-Benz. The Shanghai International Auto Industry Exhibition, one of the biggest car shows in China, opens on Thursday. As the German company was preparing for the show, it deployed security guards in white helmets to the Mercedes-Benz display, according to Chinese media. And people going to the car show told the Paper, an online news outlet, that after-sale service is important, so the incident would have a negative impact on the brand. Daimler, which owns Mercedes-Benz, confirmed that an agreement was reached and said it has suspended the dealer's franchise in Xian. It also said it was investigating its customer service and business operations. Mercedes-Benz in China issued an apology on its official Weibo account. "We are deeply sorry for the customer's experience; it has deviated from the principle that the Mercedes-Benz brand has adhered to," it said. Authorities in Shaanxi province and nationally also felt the heat of the media blaze. The market regulation bureau in Xian investigated the Mercedes-Benz reseller where the woman purchased the car. It had already urged the dealer to refund her money as soon as possible. The provincial Market Supervision Bureau also said it would launch a special campaign aimed at rectifying problems in the automobile field, according to a local Shaanxi news website. And the China Consumers' Association held a forum Wednesday about automobile consumer rights protection. So "Wang" got her settlement, and the authorities said they would work to fix the system that caused her so much grief in the first place. 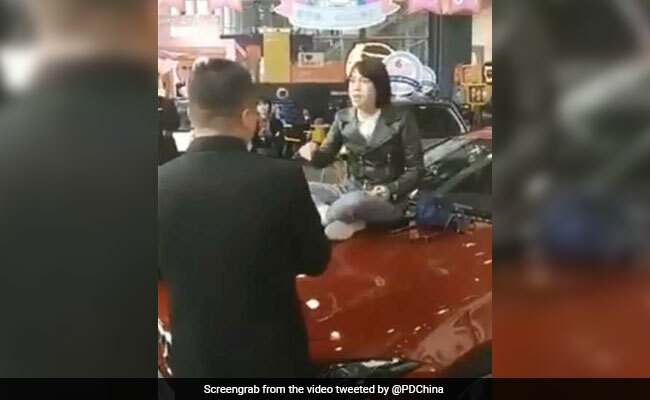 "Nobody wants to sit on the hood if they have the proper way [to protect their consumer rights]," she told a Chinese newspaper, adding that she was emotional when she staged the showroom protest. "I did it because I was feeling helpless," she told the Southern Weekly. "I hope there won't be helpless people in the future."